Synthetic peptide within Human CRCP aa 1-100 (N terminal). The exact sequence is proprietary. WB: HeLa and Jurkat whole cell lysate (ab7899). Human prostate and ovary cancer tissue lysates. Mouse kidney and rat brain tissue lysates. 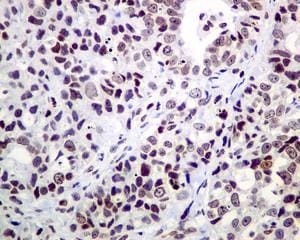 IHC-P: Human ovarian carcinoma and breast tissues. ICC/IF: LnCap and HeLa cells. IP: Human prostate cancer tissue lysate. Our Abpromise guarantee covers the use of ab139264 in the following tested applications. IHC-P 1/200. Perform heat mediated antigen retrieval with Tris/EDTA buffer pH 9.0 before commencing with IHC staining protocol. DNA-dependent RNA polymerase catalyzes the transcription of DNA into RNA using the four ribonucleoside triphosphates as substrates. Specific peripheric component of RNA polymerase III which synthesizes small RNAs, such as 5S rRNA and tRNAs. Plays a key role in sensing and limiting infection by intracellular bacteria and DNA viruses. Acts as nuclear and cytosolic DNA sensor involved in innate immune response. Can sense non-self dsDNA that serves as template for transcription into dsRNA. The non-self RNA polymerase III transcripts induce type I interferon and NF- Kappa-B through the RIG-I pathway. Accessory protein for the calcitonin gene-related peptide (CGRP) receptor. It modulates CGRP responsiveness in a variety of tissues. Ubiquitous. Most prevalent in testis. Belongs to the eukaryotic RPC9 RNA polymerase subunit family. Diluting buffer and concentration: 5% NFDM/TBST. Immunohistochemistry (Formalin/PFA-fixed paraffin-embedded sections) analysis of human breast tissue labelling CRCP with unpurified ab139264 at 1/100. Heat mediated antigen retrieval was performed using Tris/EDTA buffer pH 9. A prediluted HRP-polymer conjugated anti-rabbit IgG was used as the secondary antibody. Counterstained with Hematoxylin. Immunohistochemistry (Formalin/PFA-fixed paraffin-embedded sections) analysis of human breast tissue labelling CRCP with purified ab139264 at 1/200. Heat mediated antigen retrieval was performed using Tris/EDTA buffer pH 9. A prediluted HRP-polymer conjugated anti-rabbit IgG was used as the secondary antibody. Counterstained with Hematoxylin. Immunohistochemistry (Formalin/PFA-fixed paraffin-embedded sections) analysis of human breast tissue labelling CRCP with unpurified ab139264 at 1/50. 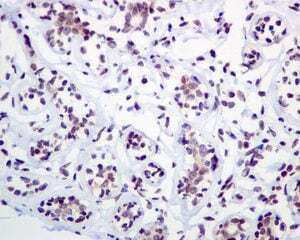 Immunohistochemistry (Formalin/PFA-fixed paraffin-embedded sections) analysis of human ovarian carcinoma tissue labelling CRCP with unpurified ab139264 at 1/50. 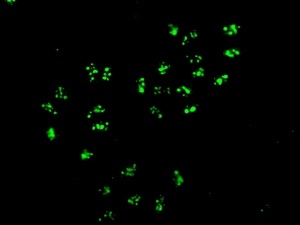 Immunocytochemsitry/Immunofluorescence analysis of LnCap cells labelling CRCP (red) with unpurified ab139264 at 1/100. Cells were fixed with 4% paraformaldehyde. 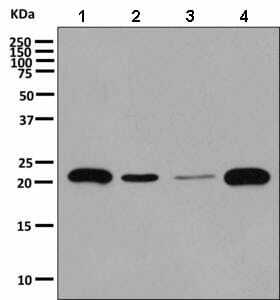 An Alexa Fluor® 555-conjugated goat anti-rabbit IgG (1/200) was used as the secondary antibody. Counterstained with DAPI (blue). Immunocytochemsitry/Immunofluorescence analysis of LnCap cells labelling CRCP (red) with purified ab139264 at 1/250. Cells were fixed with 4% paraformaldehyde. An Alexa Fluor® 555-conjugated goat anti-rabbit IgG (1/200) was used as the secondary antibody. Counterstained with DAPI (blue). Immunocytochemistry/Immunofluorescence analysis of HeLa cells labelling CRCP with unpurified ab139264 at 1/100. ab139264 (unpurified) at 1/50 immunoprecipitating CRCP in human prostate cancer tissue lysate (Lane 1). Lane 2 - PBS. For western blotting, a HRP-conjugated anti-rabbit IgG, specific to the non-reduced form of IgG was used as the secondary antibody (1/1500). ab139264 (purified) at 1/100 immunoprecipitating CRCP in human prostate cancer tissue lysate (Lane 1). Lane 2 - PBS. For western blotting, a HRP-conjugated anti-rabbit IgG, specific to the non-reduced form of IgG was used as the secondary antibody (1/1500). There are currently no Customer reviews or Questions for ab139264.